Happy New Year to all County Recurrents and their families ! Please be advised that "County Recurrent" is presently field testing winter survival and recreational equipment in the Eastern Sierra Nevada and pursuant to a Non Disclosure Agreement is unable at this time to discuss the nature of said field testing. Dateline: December 6, 2008, Will Rogers State Beach, Pac. Pal., Calif.
1. Team Rendezvous and Stretch at Will Rogers Tower 8 (see photo below). (All Photos by Will Maguire unless otherwise indicated. Dec. 6, 2008). 4. BuzzKill at WRHQ (a series of pull ups and chins up that will leave you retching and calling out for 'mama'). Brother Bill posing for the camera and OLS David Carr calling for backup ! 5. More soft sand running to Will Rogers Tower 18 and back. 6. Dragging of lifeguard equipment across soft sand at Will Rogers Tower 14 in front of WRHQ. 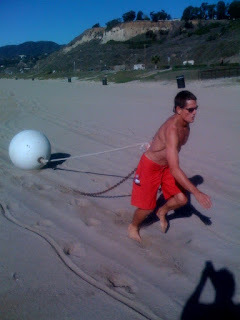 In this case, the Will Rogers summertime Baywatch Buoy, rope and chain. 7. 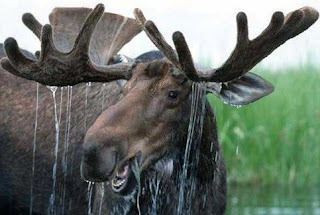 Buzzy: time for shower and a meal. Ready for the rest of the day. Thinking about a long go-out in the ocean... and maybe a 5 mile run before dinner. The Rest of Us: puke, drink water, pass out, wake up, seek out aspirin, caffeine and sugar. And last but not least, the undersigned (center) flanked by the Freakishly Tall Kerbox Brothers, Buzzy (left) and Bill (right), the evening before, Friday, 12.05.08 at the Buzzy Kerbox Photo Exhibit at PaliSkates, as previously posted on this blog last month. "County Recurrent" News is 10-7. Jay Butki, aka "Butki-san", pka "Aquamoose"
Re: "County Recurrent" News has just discovered that one of LACo's FINEST, Rescue Boat Capt. 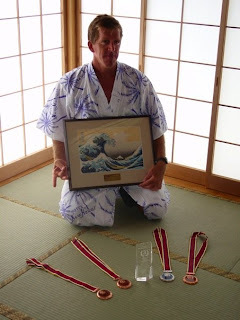 Jay Butki, has been selected "Paddler of the Week" by Paddleboard.com￼ for the week of Dec. 15, 2008. (Photo by Tandis Morgan. Used here with permission)￼. Jay Butki, Fact or Fiction. Man or Myth. Legend or Legman. World Traveler, Paddleboarder, Ocean Lifeguard, Rescue Boat Captain. I present to you now, ladies and gentlemen, Butki-san, as shown in the photo above in traditional Japanese ceremonial robe upon presentation of lifeguard competition swag at conclusion of Sanyo Bussan Lifesaving Cup, in Onjuku, Japan, during the first week of September 2008. - Jay's photo (aka, Butki-san) by Tandis Morgan-LA County, CA (1st 2008 & 2007 USLA Ironwoman), USLA Team Member, Sanyo Bussan Lifesaving Cup 2008. 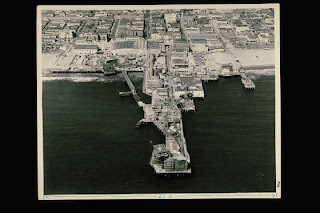 (note: The Navy St. lifeguard tower can be seen to the right (or south) of where the Navy St. Pier pilings and the remains of P.O.P. 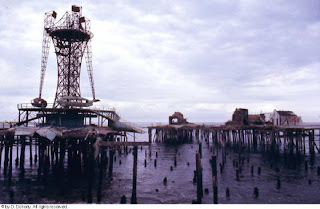 pilings that took years to remove during the 1970's). "Fear and Panic at Navy St. Pier", by Lt. Don "Rosie" Rosenthal, Ret. Date: Labor Day (date and year not specifically recalled), in the early 70's (before County Merger). The day started slowly, slightly overcast, and the surf rather calm. We could see that some of the swells were starting to increase. I requested some additional lifeguards be called in to render possible assistance as the day wore on. Not remembering the Captain at that time (I believe Bob Williams, and Don Rohrer the Lieutenant). Due to the possible slow day, the budget constraints, few were hired to work. The swells started to increase, and the current pulling north, quite strong. We had another lifeguard come on duty at Navy Street. Keep in mind this is about 25 years ago, so dates and names have drifted from memory. As the day wore on, and the surf grew, and crashed, the current soon had the buoy line bending North. The current started sucking swimmers into the buoy line, and a few rescues were made for those who slipped past the line, and headed for the Navy Street Pier (pilings). (note: The above photo is representative of the type of pier pilings that existed during the rescue sequence described herein). We requested additional lifeguards, as the crowd was growing (at Rose Ave and Navy). I remember Rim Fay was with one of his children (on a day off). We recruited Rim to help out while we waited for more guards to help. We kept making PA announcements to the public to move South from Navy. Soon we had some larger swells, and crashing waves. Needless to say the current was pulling very hard towards the pier (pilings). I noticed one of the broken pilings that belonged to the pier. Wrapped around the crusted broken piling, like a monkey, was a man who either didn't hear us or speak English. I hit the water, as there was a break in the swells. As I swam to him, using the current, I would raise my head and yell at him to let go of the piling so I could take him between the two sections of the pier where there was a small beach. The victim was terrified and hung on to the piling. I literally had to peel him off of the piling. As you could guess, I looked for the next set of waves, and was not disappointed. The first of about five waves was just about to hit the man. I was able to peel him off of the piling as the first wave broke. The set continued to push us into the pilings under the pier. These were large, powerful waves, and I held the victim in front of me, no way losing him. The waves pushed us around like a pinball from piling to piling. Most time under water, with very little foothold. I managed to get the victim and myself through this maze of mussel encrusted pilings, cut and scratched but on the small beach between the Navy piers tired and safe. I looked up, and saw that Ed Perry and Walt Reeves (deckhand) had brought the boat (Salvador I think) in as close (between the piers) as they could to see if I was all right. Walt told me later, that Ed was sure I would not make it. I did, and the victim did as well. I didn't have time to think if I could come through the pilings. The large breaking (boomers) that propelled me through the "Old" Pier. I'm sure other Lifeguards have had some "hairy" adventures in "Mother Ocean". In 37 years, I had others, but this one I described, is hard to forget. "Rosie" aka (Don Rosenthal 1951-1987 not dead, just lifeguarding years). Editor's note: Many Thanks to Rosie for his contribution to the ongoing "County Recurrent" effort to share some of the memorable rescues of our ocean warrior clan. L-R, Front: Danny Katayama, Gary Crum, Nino Duccini, Buddy Bohn. L-R, Back: Mark Keller, Greg Pfeifer, Alf Laws, Brooks Bennett, Bill Mount, George Lowerre. Photo/team member names courtesy of Buddy Bohn. "Then I was old - the oldest guy on the team - and I always thought Greg Pfieffer was the youngest so they put us together every where we stayed so we could temper each other. It was on that trip that we discovered we were neighbors on Frazer Street behind St Monica Station 25. I lived with a couple UCLA college buddies and he lived with his parents, (because he was barely out of diapers.) I had known him as a lifeguard in '81, but never made the connection that he was that little kid next door in the sixties. Now I am older - we both work the Northern Section and were assigned as partners on a call car for a night drill tonight. Greg's amazing - he's still making the Taplin swim team - I am still trying to make the paddle team (still trying, but not getting any closer). That trip in 1981 was a blast. The photo is a blast from the past. Thanks for resurrecting it. "We had a great team with a lot of depth and experience. We worked very hard to raise the money and sponsorships for the ’81 Wieland Shield Team. We were the first event (Surf Movie) held at the newly renovated Hermosa Beach Community center (the old Pier Ave. School). TRW and Continental Airlines helped to sponsor as well. Every south bay chamber of commerce gave us swag to hand out and a local wetsuit company gave us product for a garage (SSH) sale fund raiser. We held several parties and raffles where many lifeguards attended and contributed to the teams many expenses. The team was invited and toured New Zealand’s north island Auckland area beaches such as Piha and Mangawai Heads surf lifesaving clubs. We were billeted out with the friends and family of Paul Johnson who was then president of the Mangawai club. Our idea was to get as much training and team building as possible before heading on to Victoria, Australia and the Shield competition. 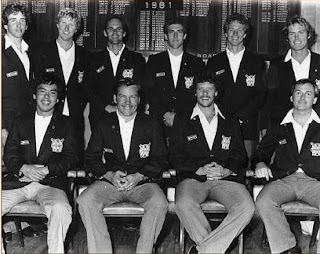 I was able to connect with several of the New Zealand team members who attended the World Lifesaving Congress of 1979 in Newport Beach when I was on the USA team. Gary and I also connected with the Kiwi’s we had hosted in L.A. the next year. All in all, the team came together in Auckland and we were treated as guests of honor while we preached about Professional Lifeguarding in L.A. County. We had some friendly competition, good surfing and great camaraderie. We then traveled to Melbourne, Victoria and State Centre SLSA as their guests of honor where we attended many official functions and photo ops to satisfy the Australian sponsors. We’ll all remember traveling in vans for hours to make a brief appearance and then pack back in and drive for hours, all away from the coast where we wanted to train and surf. The highlight of these road trips were the Aussie sponsors Big-M (the national milk board) and their Big-M girls who strutted around in the smallest swim suits any of us had seen up to that point. The dark side of these long frustrating hours in the van was that mutiny was a distinct possibility and I remember Gary trying to keep Nino and me from choking each other out. My memory is a little fuzzy on some of these shaky moments, repressed memory I think. Kevin Roderick was our guide and host who never tired of our windge’in, sniveling, and general discontent with too much road and not enough ocean. We were convinced it was an Aussie plot. We finally got to the coast and all was well with the world, good surf, competition and friends. Our hosts were very generous and held big surf club dinners at each surf club we toured. The club ladies had obviously baked for days and their hospitality was legendary. During this leg of the tour we were again billeted out in the club member’s homes which were often a great distance away. Their common response when asked where they lived would be “just down the road”, which could mean anywhere from a couple kilometers to many many kilometers. You never knew until you were on your way and road slipped away and the time dragged on. Don’t worry mate, it’s just down the road! I remember Bill had used an American slang word in a conversation with this very proper club hostess and when we explained the Aussie’s use of the same slang but with a quite different meaning, he insisted we drive back so he could apologize and reestablish his honor. We didn’t go back. I also remember why we put Bill with Greg, he was the picture of morality in need of a disciple, and I’m a believer in osmosis. The days of the Shield came and we performed very well although losing the competition by a slim margin, but there were so many great races and individual standouts. 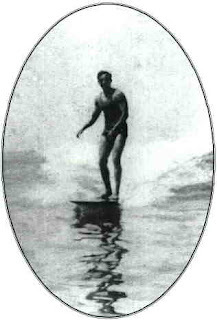 Nino got off his death bed to blow doors in the surf race, another of his legendary psych-up performances. I think this was one of the last shields that had so may sand events, like run relays, run sprints and beach flags. In those days we’d have to use the ski while in Oz and they would have to row the dory while in the USA. The international standard for paddleboards still hadn’t been established either. The USA paddle 11’6’’ heavy boards and the Aussie used their “Mal’s” 10’6” which were 15 pounds or so. Today we use that 10’^’ standard. The summers in Victoria are famous for radical weather changes and they are apt to say that if you don’t like the whether, just wait twenty-four hours. In other words one day would be laser beam hot and the next day you’d be wrapped in blankets and sleeping bags. You have to remember we are down under in January and February when we have no tan, looking fish belly white and primed for the sun burn of a lifetime. The team made a positive impact on our hosts and many lifetime friendships were forged. Some of the influences we left behind were the development of a seasonal professional lifeguard system managed by State Center to augment the clubs volunteer schedule. The building of L.A.Co. Style wooden lifeguard towers with a centralized communications system. What we brought away from this educational exchange was the value of corporate sponsorships to fund our services and the value of promoting the highest level of surf lifesaving competition to show case not only our lifesaving prowess but give a positive association with said sponsors. What this spawned was our relationship with Frank Suddoth of Plough Industries and Coppertone sponsoring all the trash barrels in L.A.Co. With a Coppertone logo on each barrel. Ken Johnson of Beaches and Harbors was the guy who was able to convert our lesson down under into reality; next came our vehicles. The promotion of our competitions and showcasing our departmental sponsors was soon taken on by one of our own entrepreneurial lifeguards, Scott Hubbell and the Bud Light Ocean Festivals. Shortly after the Shield several of our team returned to the USA, one due to illness and the others because a national strike was threatening to close down much of the nations labor services, like air travel. We bid our mates farewell and continued on to Queensland as planned. The team arrived in Brisbane and was received and guided by Kevin Hoskins who took personal charge of our teams well being. Our first stop was Queensland State Centre and re-introductions with one of our oldest Aussie friends, Jack McMaster’s their head administrator. Jack had toured with an all ASLSA team hosted in LACo in the 1960’s. We then toured the Gold Coast and were billeted by the Northcliffe Club. We then competed in their state championships with a much smaller team but one not lacking in enthusiasm and skill. Danny Katayama, Greg Pfeiffer and Mark Keller were crowd standouts. After a very positive impact on the Gold Coast, Kevin took us down to the Sunshine Coast where we toured Alexandra Headlands with our friend Hayden Kenney and then on to Noosa where we had a great trip out and around the park headlands and surfing at Tea Tree. The Noosa SLSC hosted us and we were able to witness the early development on Sunshine Beach which now has its own surf club and custom homes that cover the sweeping ocean view hillside. I remember George Lowerre and I standing on a virtually barren Sunshine hill side looking over a real estate flyer of this future subdivision and fantasizing about buying the best ocean view lot, which was huge, for 100k; its worth millions now. The Queenslanders had gone out of their way to make our stay memorable and it wouldn’t be too long before we’d host a thirty man team from Queensland in L.A.Co. They too were looking for a way to professionalize lifeguarding to assist their volunteers around their state. Our ’81 tour was officially wrapped up and the last members headed back home, while a few lingered a bit and a few took in another round in New Zealand. The experience of a life time; significant in promoting lifesaving along side friendly competition, we established lifetime friendships and bonds between our two countries. "Yeah Mark Keller and I were the youngest guys on the team, we were 20. Alf and George were really old back then--like 32 or 33, and Bill was the old man of the sea--he was like 34 or 35! I had finished my second year of swimming for John Joseph at Santa Monica College and had been recruited to swim at San Diego State in the fall. I was registered for my classes and everything, but then I ended making the Wieland Shield team. The trip was right in the middle of the semester and swim season so I ended up taking the year off from school and trained another season with J.J. at S.M.C. I was in great shape and was confident I'd do well in the competition because I have always preferred saltwater and surf to chlorine and flip turns! I was also young and, as J.J. would say, "full of piss and vinegar!" When we got to Australia I just wanted to surf, party and drink beer! Because of this I didn't quite see eye to eye with our "coach" Gary Crum. We butted heads a number of times. They had me room with Bill because he was everything I wasn't--a mature, mellow, family man and Christian, but we actually hit it off quite well. About 25 years later Bill retired as the Assistant Chief of the Culver City Fire Dept. and took a summer schedule opening for me at Malibu. Neither of us ever thought the little kid who lived next door to him on Fraser St. in 1964 and the wild rebel of the 1981 Wieland Shield would someday be his supervisor! Of course he did a great job and is now enjoying his second career as a permanent lifeguard. You know what they say "60 is the new 40!" I remember competing in the belt race and surf race in the Queensland State Championships on this trip. The surf was big, Hawaiian 10-12 feet, triple to quadruple overheard. The current was raging. Boards and ski were breaking left and right. Surfboats were crashing and burning. 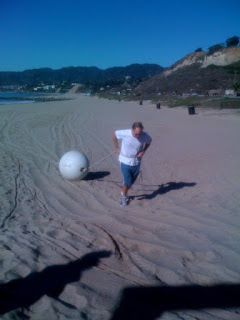 I made it to the finals of the surf race and Bill made to the finals of the Malibu board race. The young guys working the beach now don't realize what a stud Bill is! Looking back, almost 28 years, this was my first of many trips overseas and I did learn a lot. I have changed a lot since then, the world has changed a lot since then, and lifeguarding has changed a lot since then! Change is a good thing!" "Hi Will just got home (from Mexico) – too many dead brain cells... can’t remember a thing. Get something to you soon. Alf"
Editor's note: Many Thanks to Buddy, Bill, Greg and Alf for their contributions and support of this effort to share their trip down under with their County Recurrent colleagues. That's it for now. The readership is requested to forward this to any other members of the '81 team they are in touch with to see if they would like to add to this commemorative and retrospective effort. El Porto Breaks Loose ! (Photo by Phil Navarro. Photo courtesy of Phil Navarro and Arthur Verge. Used here with permission). The above photo by Rescue Boat Captain Phil Navarro shows Capt. 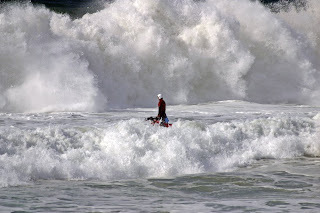 Tom Seth on a LACo PWC (jetski) battling the ferocious surf pumping at El Porto some six years ago. This same photo is featured as the Calendar Photo in this year's December LACOLA Calendar. "That Photo was taken about 6 years ago so I may be a little foggy on the details but here is what I remember. That was the year that we got some large swells early in the season that coincided with very high tides and really tore up the beach. We lost so much sand in El Porto that the waves were smashing up against the rocks at 45th ST. and we had to close the bike path. The photo that Phil took was taken during PWC training. When the surf gets big and out of control we try to get the PWC in the water to train in the difficult conditions and occasionally make some rescues. That wasn't the biggest day that I have trained in but it was the heaviest. The waves were breaking a mile out to sea on tanker reef and then reforming and detonating on a shallow sand bar about 200 yards off-shore. I remember dropping into a few waves that were dredging so hard on that sand bar that I was going below sea level in the barrel. It definitely got my heart going. After training in those kinds of conditions routine rescues and events are a piece of cake. "It may have been Winter 2002 or early Spring 2003. If you know how to get EXIF information from digital photos, it should have the date and time when shot. Other than that, I was working in the Training Center at the time and I asked Tom to call me if he was doing any training in large surf. He called me that day and I got the shots. Tom also had a rescue that day of a surfer that was caught outside and gave him a ride back to the beach. I have those photos also. That's it. Not much more to tell. Many Thanks to both Tom and Phil for sharing this Amazing Day of Surf Lifesaving ! Below Sea Level And In The Barrel ! You gotta love it ! County Recurrents will recall our post of Nov. 24, 2008 wherein the Waikiki Box Jellyfish Invasion was reported. 1. a. Any of numerous usually free-swimming marine coelenterates of the class Scyphozoa, characteristically having a gelatinous, tentacled, often bell-shaped medusoid stage as the dominant phase of its life cycle. b. Any of various similar or related coelenterates." 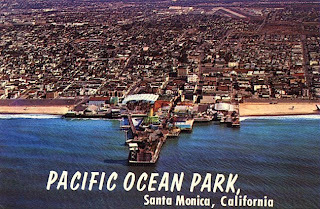 "Back in the day", in the spring of 1974, prior to the merger between LACo and Santa Monica City, the beaches of Santa Monica South were invaded by the Purulent and Prurient Purple Jellyfish. In fact, the Santa Monica City Rookie Class while engaged in a half-mile swim race from SMS T-24 to the pier were engulfed in a sea of jellyfish out front of SMS T-17, with all rookies stopping amidst this sea of jellyfish, with all rookies having been stung repeatedly. Arms were waved and the lifeguard at T-17, Paul Henne, called in to SMHQ reporting what he thought might be a shark related incident. The Santa Monica Rescue Boat with Lt. Tom Zahn and deckhand Bobby Chavez then responded, rescuing all rookies amidst the prop chopping up jellyfish. In between a set, the rescue boat was reversed inshore and all rookies safely deposited in the shallows. All rookies were then ordered to report to SMHQ to explain themselves whereupon it became obvious to the powers that be that all rookies were red with welts. One of the rookies worst stung was Arthur Verge whose near entire body was covered with welts from head to toe. Tough competitor that he was and is, he sucked it up despite the severity of his wounds. The undersigned, a rookie engaged in this infamous swim that day remembers the first sting around T-18 and swimming through and past it, then a few strokes later having his right arm hit another jellyfish and getting stung, and then tripled stroked with the same right arm to get past it and each time hitting another jellyfish and another. By the time I reached T-17 I was getting hit on the left and right arm and across the trunk. Somehow I managed to avoid being impaled by any of these purple people impalers in the face. At T-17, I stopped and looked around and while treading water realized I was surrounded by jellyfish. Shortly thereafter, all of us gathered together and began waving our hands to gain the attention of the T-17 guard, Paul Henne, followed by our rescue. That is it for today's HISTORY lesson. 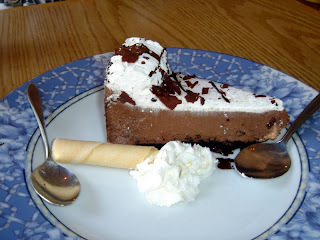 Dateline: Saturday, December 6, 2009 at approx. 0930 hrs. with LACo Rescue Boat Captain Eric Astourian in the wheelhouse. Kudos to Rescue Boat Captain Drew Greger for the i.d. ("Baywatch 15 heading towards Malibu! Astourian as Captain!"). "Likely you did not know, but Tower 14 (after a short stint at Tower 5) was my tower for my rookie year in 1968. Right in front of the old Light House, where all the guys ..... could look over my shoulder and try to slide down the Light House "rescue pole" and scoop me on rescues. Eli Gauna would try to beat me to rescues on the north side of the jetty, when I was busy watching the surfers on the south side. I stopped that by standing duty on the berm, and could get to both sides quick! What great memories! George Freeth Rides Again ! On the afternoon of December 16, 1908 a surprise winter storm suddenly descended down on Santa Monica Bay trapping several small Japanese fishing boats off today’s Venice Breakwater. 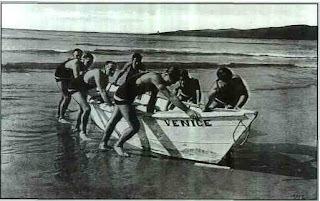 As the boats headed towards the rocks (and the then Venice Pier above it), lifeguard George Freeth lead a two and half hour rescue effort. Despite nearly succumbing to the effects of hypothermia, Freeth was responsible for single-handily rescuing seven lives and leading a final rescue effort that saved the lives of four others. Following the rescue, the citizens of Venice quickly organized a dinner that evening in his honor. Exactly 100 years later we are organizing the same including a special slide show of original photographs of Freeth and of the rescue itself. For lifeguards this rescue marked the entering of the lifeguard service into the modern age. For his actions George Freeth was awarded (by an Act of Congress) the Congressional Gold Medal for Lifesaving. Although he continued his career as an ocean lifeguard he died at age 35 during the flu pandemic of 1919. We will honor his rescue, his life and legacy on the evening of December 16, 2008 at Danny’s Deli and Bistro in Venice. Danny, a great friend of the lifeguards, is doing this at cost. Time: Cash Bar – 6:00-6:45 pm. Dinner at 7 pm. Arthur Verge will give a slide presentation on the life of George Freeth at 7:30 pm. Dinner choice – Chicken or Salmon (accompanied by rice, vegetables and soft drink). Please include your choice of Salmon or Chicken. We need all orders in by Sunday evening – 6:00 pm December 14th. FANTASY TAPLIN ! You with me ?! Forget "Fantasy Baseball, Football and Basketball!" I'd rather just watch the games and maybe participate in a Super Bowl pool, which is really quite o.k. since I am not the Head Football Coach of an NCAA Div. I Football program...... but alas I digress. 2. Pick your Section or Dept. 3. Pick your Team (4 swimmers, 4 paddlers & 4 dory teams (or 8 persons). 4. After each Relay Leg, provide your reasoning for the selection of each individual in one paragraph per relay leg. Photos are also acceptable to supplement your reasoning. 5. Submit your Fantasy Taplin Team to "County Recurrent" for consideration for publication. If you have any questions or comments, please contact the undersigned. This black-and-white image can be found in the "Hollywood Beach" section of the Gowlands' exhibition at g169. Photo courtesy of Alice and Peter Gowland. Vintage photos by Alice and Peter Gowland of the Santa Monica beach scene during the war years are on display at g169 gallery, 169 West Channel Rd., Santa Monica Canyon. The artists' opening reception is Saturday, December 6 from 5 to 8 p.m.
........During World War II, Peter worked as an engineering cinematographer for North American Aviation. He and Alice spent evenings and weekends taking portraits and shooting speculative advertising photographs. Pin-ups became popular with the armed forces, so Alice sold some of their beach pin-ups as magazine covers while Peter was in the service. The gallery exhibition includes about 80 photographs capturing the culture of California girls, Hollywood's beach and the war years. Will Douglass and Bill Bischoff ! A couple of Johnny Joseph "SMC Alumni" Swimmers. Can you imagine this team from the late Seventies with Bruce Stahl on the same team, plus Mike "Newmie" Newman, Mike Moses, etc., et al. Hey, I might be off by a year of two with some of these guys, but just go with it. You could win a Taplin with these two guys leading the swim and Billy doubling up and paddling too ! You could literally start the Taplin with Bischoff as lead swimmer, drop in a couple of ok swimmers and then finish off the swim chores with Douglass ! Then Billy could anchor the paddle portion. Done. First Place ! Been There, Done That ! Throw the 'Freakingly Fast' Stahl in there too on the swim relay portion and you could basically coast into the dory leg. What's Big, Red and Beachin' ? That's the answer to the question. Description: 2007 Ford F550 Crew Cab Lariet 4X4, power stroke diesel. It's Brand Spanking New ! Custom designed by our very own LACo Lifeguard Dive Team. It's taken since it's delivery to complete. In the photo above, it sits in its alpha parking spot at Central Section HQ, although it's tactical positioning is dependent on diving locations. Per Section Chief Scott Davey, it is also fully outfitted to meet the Department's dive team needs. Many thanks to Chief Davey for his comments. Last but not least, word has it that our Dive Team and Chiefs are very stoked and proud of this "Dive 1" Dive Team Truck. Keeping you, the County Recurrent, in the loop ! Swim At Your Own Risk ! No Lifeguard on Duty ! The sun has set and the Lifeguard has gone home. Waikiki, Oahu, Hawaii, Queen's Beach. And yes, that is Diamond Head in the background. Coast of O'ahu at the end of Waikiki overlooking the Pacific Ocean. It was originally named Laeahi by the ancient Hawaiians).